This is a great fresher-upper for your hair. It smells amazing, adds great volume to my limp locks and holds all day. This doesn't have as much oil-fighting power as a traditional dry shampoo but it is still good to add life to second-day hair. Another bonus is that this doesn't leave a white cast on my brown hair. I purchased the purse size of this first and just had to get the full size prod...read moreuct. This product is pricey but it is so unique and effective that it is worth it. The product lasts quite some time as well. If your hair is just washed and blown-out and it has that supersoft feel that is prone to falling flat, this is what you need. Flip your head over and sweep a few quick spritzes for instant volume and texture -- that gives hair grip without feeling dirty. 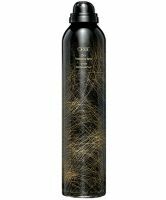 The signature Oribe scent is a plus and the hold lasts all day. This stuff gets rave reviews as a volumizer. My thin, flat hair is transformed with this spray. However, it's mentioned that it can sub as a dry shampoo...this is probably for girls with thick hair. I cannot go more than 2 days without shampooing, and this spray alone does not soak the grease. As a volumizer, its fantastic. Be warned: it costs some bucks. I ordered it on Amazon and it was still a whoppin $38! On the plus side, the bottle is large and lasts quite awhile.